Meat chickens in Australia are never raised in cages. How are they housed and reared? They are grown on the floor of large sheds or barns. The floor of the barn will always be covered with a bedding material (the industry calls this bedding ‘litter’), which comprises some form of absorbent material, for example wood shavings, rice hulls or chopped straw, and which effectively provides insulation from the floor of the barn. Their barns are designed and ventilated so that they provide, as closely as is possible, the chickens’ ideal climatic conditions, and food and water is always close at hand (or beak!). Additionally, in some production systems the chickens are also provided with an outdoors range. There are lots of photos on the ACMF website of both the exterior and inside a typical chicken shed (see http://www.chicken.org.au/page.php?id=200&gallery=Broiler%20Farm for some examples). In the photos shown below of chickens (of increasing size / age) in typical sheds, you can clearly see the ‘litter’ and the feeders and drinkers provided. 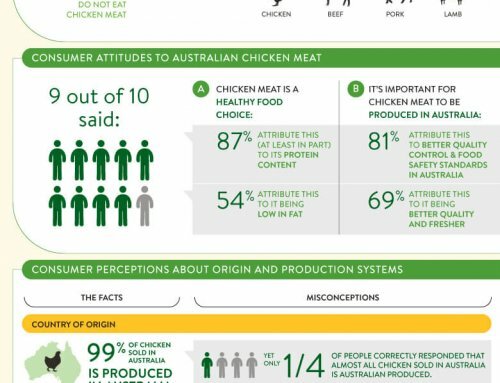 Why is it, then, that 96% of Australians believe cages are used, at least to some extent, in chicken meat production? What this probably boils down to is that most people are not aware that the chicken meat and egg industries are completely different industries, and utilise completely different strains of chickens. The days of the same breeds of chicken being used for meat production as for egg production are long gone. Meat chickens have been selectively bred for many generations and over many decades for improved growth rate, to put on lots of muscle (meat), and for the efficiency with which they convert feed into meat. Modern commercial egg laying breeds, on the other hand, have been selectively bred to optimise the number of eggs they produce. This has resulted in the two types of breeds which not only perform very differently, but also looking quite different. A typical meat chicken (left) will be larger and more rounded in shape (reflecting the increased amount of muscle it carries) than its counterpart from a commercial egg laying strain, which will be lighter in frame and finer featured. Comparing a meat chicken with an egg laying strain hen is a bit like comparing a whippet to a mastiff – both dogs, but bred to do totally different things and look quite different as a result. 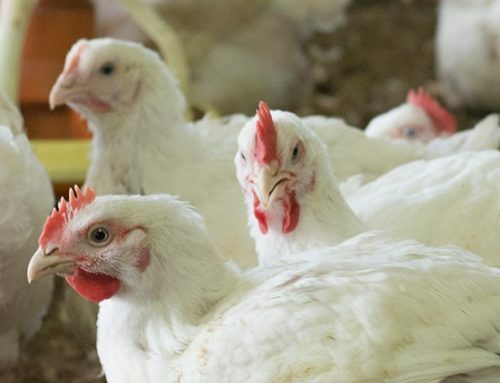 To illustrate the difference between the genetic potential of modern meat chicken and egg breeds, a NSW High School grew a small flock of both commercial strains out side by side – same feed; same facilities; same treatment – to compare how they grew. 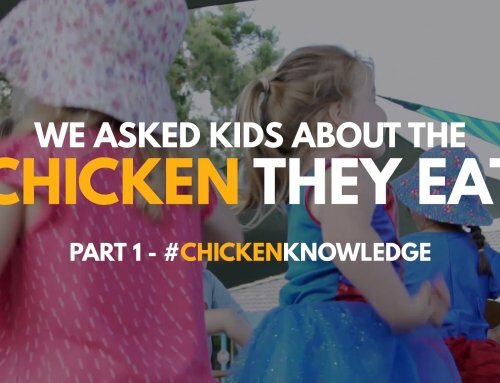 For details of how they did this and the full results, see http://www.chicken.org.au/page.php?id=205. However, here is the graph of their results. At the same age, the meat breed chickens were more than four times the size and weight! Meat chickens are grown until they reach a suitable size for processing for human consumption, which might be up to 6 or 7 weeks of age, at which point they are collected from the farm and taken to the processing plant. Both males and females are used. 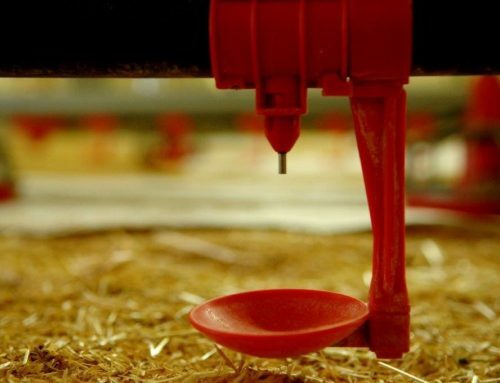 Commercial egg laying strains don’t even start laying eggs until they are at least 18 weeks of age, and they have a productive life of well in excess of a year thereafter. Only females are used. The structure of the two industries is also quite different, and there is virtually no crossover in ownership or participation in the two industries. So much for the cage myth! 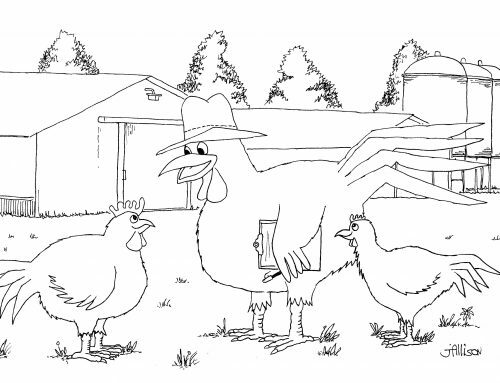 Coming up next month…another myth debunked, when I discuss the origins of the “hormones and chicken” misconception and why hormones aren’t used in chicken meat production.